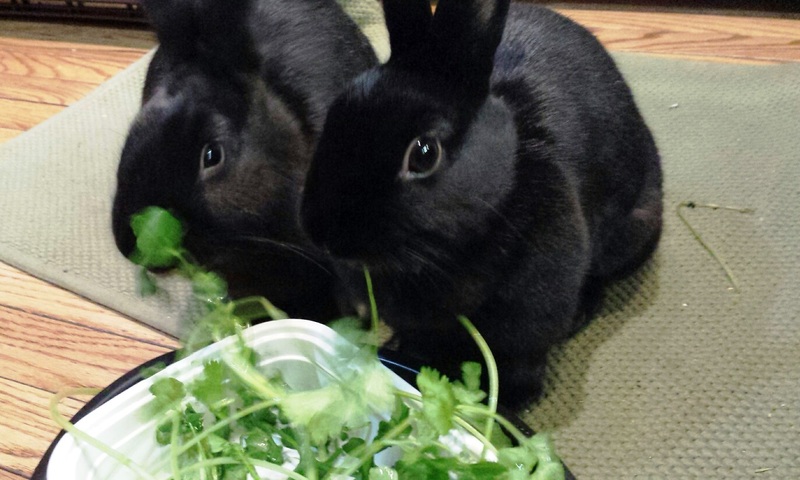 Binky and Queenie are now a happy bonded pair in WBEZ reporter Monica Eng’s home. But she had no idea how much work they’d be to care for. When my daughter started pleading on the phone, I was adamant and firm: She could absolutely not bring home a bunny from the farm where she was staying. That was last August — now every morning we wake up early to feed our little black and white furball named Binky. He gets to eat fresh, thoroughly washed organic greens long before we make our own eggs and coffee. We have a 50-pound box of timothy hay on the porch and we’ve placed bunny litter boxes all over the house. In short, my home has become bunnytown and I am its No. 1 public servant. Parents who are thinking of buying their kids a cuddly little bunny for Easter, might want to think twice. Oh and P.S., they also live for about 10 years. So we expect to be caring for them long after the the kids leave for college. That’s just one of the reasons abandoned rabbits are expected to flood places like Red Door Animal Shelter in a few weeks. Some groups have also pushed for a ban on rabbit and chick sales in the weeks leading up to Easter and a few independent pet stores have voluntarily agreed to do so. But for those who do purchase rabbits, another challenge is finding companions for them. Researchers say bunnies get angry and depressed when they&apos;re in single-rabbit homes. But they&apos;re actually pretty particular about their pals, which is why experts recommend choosing a new bunny mate through a series of speed dates at places like Red Door. Some rabbits need several dating sessions with numerous candidates. But Binky was lucky to fall in love with a dainty little black rabbit called Brooklyn on his first date. We then needed to take them home for a series of bonding sessions, which consisted of peeing to mark territory and mounting each other. If you want to know how our bonding sessions went, all you need to know is that the demure little rabbit that we used to call Brooklyn, is now named Queenie. We’ve had to get used to a lot of things, like having rabbit litter boxes around the house. We can’t leave town without finding trained rabbit sitters. And we have accepted that our wood work and furniture are going to be full of chew marks. For fun, sometimes we watch a series of videos by comedian Amy Sedaris on things like how to massage your bunny. If this doesn’t sound like a great time, you may want to stick with chocolate bunnies this Easter. But us? At this point we wouldn’t have it any other way.